Discovering Opportunity In The Midst of Disruption and Change. We live in our world that is changing at breakneck speed. Change is the new normal. It is a TGIF world (Twitter, Google, Instagram and Facebook). Change often evokes negative feelings and anxiety in many, but it doesn’t have to. The future is bright for those who understand, embrace and leverage change. In a world of unprecedented change, how can we not just survive but thrive? This book explores some of the major changes shaping the cultural landscape and presents the transformational qualities that every forward-looking leader possesses when embracing and leading change. More than ever, now is the time that teams and organizations need leaders who can discover opportunity in the midst of disruption, choas and change. The future is bright for those who understand the times and know what to do. We live in our world that is changing at breakneck speed. Change is the new normal. It is a TGIF world (Twitter, Google, Instagram and Facebook). Change often evokes negative feelings and anxiety in many, but it doesn’t have to. The future is bright for those who understand, embrace and leverage change. In a world of unprecedented change, how can we not just survive but thrive? 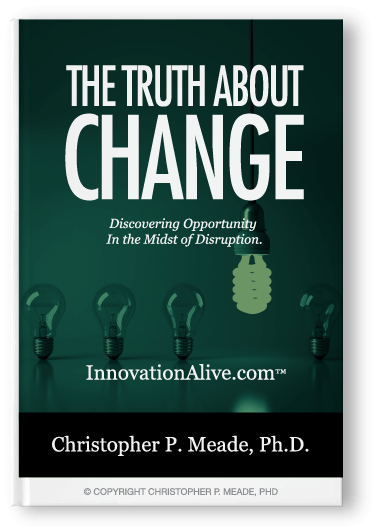 In this informative and engaging keynote talk, motivational and inspirational speaker, Dr. Christopher Meade, unpacks three non-negotiable attributes that are the antidotes to the challenges that change brings and that each of us face in life and work. There are three changes every person can count on: new problems, new pressures and new possibilities. The Chinese word for “crisis” is composed of two words: danger and opportunity. Ask any entrepreneur and they will tell you that opportunity lurks wherever there is chaos and disruption. There is opportunity in the midst of disruption.